Venison is one of those meats that many people shy away from. Perhaps because they are not sure how to cook it, and then there is the 'Bambi' factor. Neither of these reasons would put me off and I have cooked venison in the past but I find that it is just not readily available at the butcher or the supermarket. It's nice to know that I'm in tune with top chefs Valentine Warner and Ainsley Harriott who were championing Venison and Mustard on the Great British Food Revival and I couldn't believe how closely Valentine Warner's views about venison were to mine! 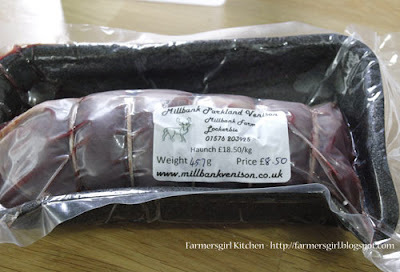 So I was excited to see that as part of Flavour Fortnight in August this year, a Vension Farm Walk and tasting was offered by Millbank Parkland Venison just outside Lockerbie. Millbank Farm is run by Emma Boyes with her husband Gareth, and after a walk around the farm to see the deer, Emma prepared some recipes which we were able to taste. The sausages and burgers were delicious and all the dishes were full of flavour. 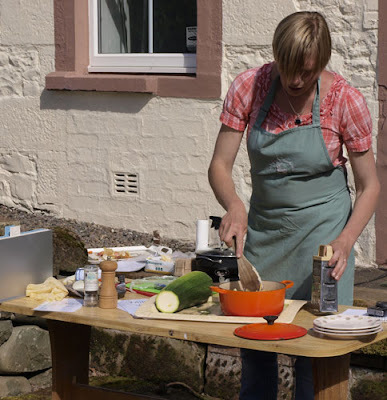 I was intrigued to see what I could make with this local produce, so last month I contacted Emma to see if she would like me to make some dishes with venison from her farm. Venison is regarded as the premier meat for the health conscious. With the lowest fat, lowest cholesterol and the highest protein content of any meat combined with high iron content and omega 3 it is ideal for those on a healthy or low cholesterol diet. Not all venison is the same. Venison varies within species, age, gender, whether farmed venison or wild venison as well as the condition and health status of the deer. There are 6 deer species in the UK. Scottish venison includes fallow, red, roe and sika deer. We believe fallow and roe venison are of the highest quality due to the texture and flavour of the meat. At Millbank, through the choice of deer combined with how they manage and select the deer, they aim to consistently provide the very best culinary experience. Millbank Farm Parkland Venison is Fallow Deer venison and wild Roe deer which are less gamey than Red Deer venison and much more tender, it is low in fat and Millbank Farm venison is ethical, welfare friendly, stress free, low food miles, low carbon footprint, processed in their natural environment. 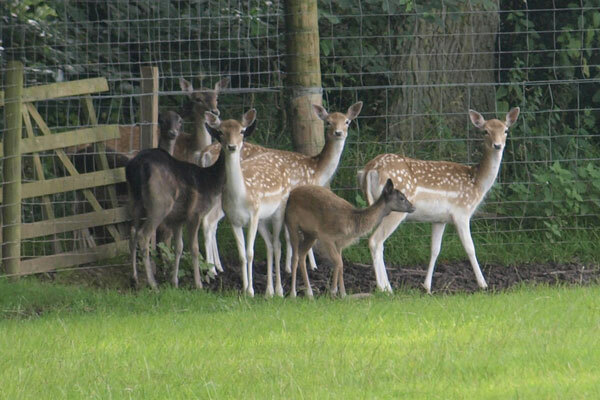 This information and more is available on the Millbank Farm Parkland Venison website. I wanted to come up with a recipe full of the flavours of autumn, which complemented rather than overpowered the venison, apples and squash seemed to be the answer! You could easily increase the quantities to serve a larger group, this haunch will provide two half inch thick slices of venison per person for 6 people, or three slices for four people. 1. Heat the olive oil in a pan on a medium heat. 2. Brown the haunch of venison in the pan, then remove to an oven proof dish. 3. 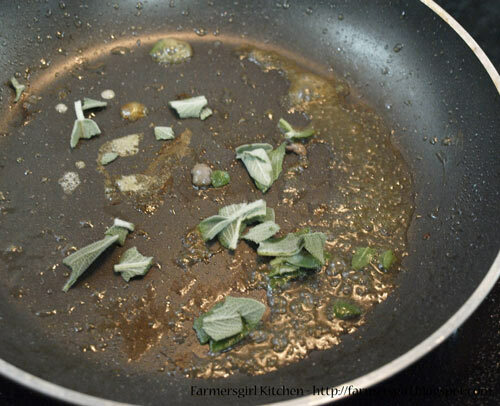 Add the butter and sage leaves to the pan juices and cook for 1 minute, then add the cider and mustard. Let it bubble up for 2-3 minutes, then add to the venison in the ovenproof dish. 4. Cover with foil and bake in the oven at 180C for 45 minutes. 5. Once cooked, lift the venison onto another plate cover with foil and allow to rest. 6. 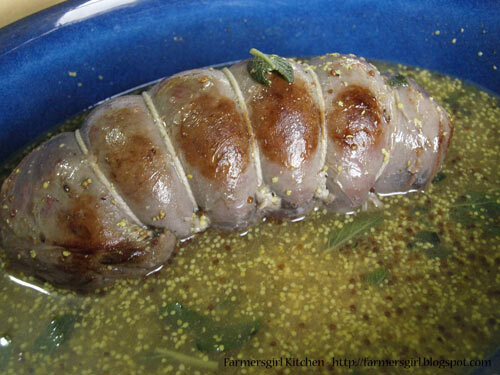 Pour the mustardy juices into a small saucepan and heat until simmering. 7. Mix the teaspoon of cornflour with the creme fraiche and add to the juices. 8. Cook until slightly thickened. 9. Carve the haunch of venison in thick slices and serve on butternut squash and apple puree with the sauce poured over generously. 2. Peel, deseed and chop the butternut squash into cubes. Cut the apples in half and take out the core with a teaspoon. 3. 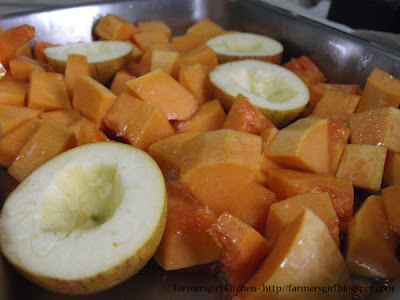 Put the 3tbsp of olive oil into a roasting tin and add the butternut squash and the apples to the tin and roast in the oven until the squash is tender, about 30 - 40 minutes. 4. When the squash and apples are soft, remove the apple pulp from its skin and puree both with a stick blender or liquidiser, season to taste. The consistency should be similar to mashed potato. The Millbank Farm Parkland Venison should be served slightly pink to be enjoyed at its best. 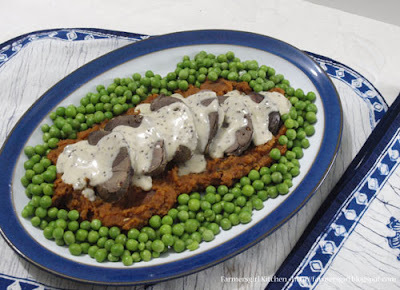 The flavour of the meat is excellent and goes really well with the sharp heat of the mustard and creme fraiche sauce and the sweetness of the butternut squash puree and cider. 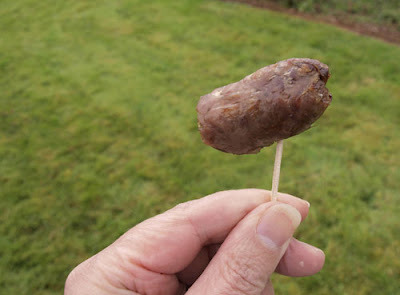 online farm shop or take part in the giveaway below for a chance to win a taster pack for two people containing 2 rump steaks, 2 vension burgers and a ring of venison sausage. Details of what you need to do are in the Rafflecopter widget with opportunities for bonus entries. Please remember to read the terms and conditions. I'd have a go at making a venison chilli, had it once before years ago and it was divine. I love venison! Had a venison haunch today (but at a restaurant) and I generally serve it if I am cooking for christmas. I think I would make a stroganoff with the venison adding some mushrooms as well. I'm a venison fan too. And I love your picture of the cute deer. Sweet. But, yeah, I'll still eat them. Arghh I hate these rafflecopter things. I would make roast loin with mash and a redcurrant sauce. I would make Texas Venison - It is similar to Carne Guisada, and goes well as a main course or a filling in a tortilla. The venison comes out moist and tender in a slow cooker! I would probably just try and roast it in the oven. Venison casserole made with echallion shallots and homemade rown jelly. A nice venison, red wine and mushroom casserole. A nice venison, red wine, and mushroom casserole. Casserole, as it's so cold, it's casserole weather! I love venison. I'd like to do a lovely venison steak with a madeira and mushroom sauce. Hmmm, a nice stroganoff I think. Venison with a black cherry sauce! I love to make a meat loaf with venison and tasty mushrooms. Venison sausages with mash, onions and peas. A casserole with lots of mushrooms, I think. 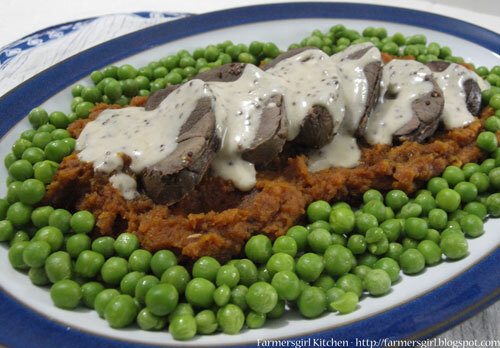 I have never cooked venison so I would try your recipe of cider and mustard sauce. I never cooked Venison before but i would may be add a red wine sauce ? I would make a hearty casserole. I'd cook a lovely venison bourguignonn. It is really a perfect meat for matching with wine! I'd keep it for Christmas & cook a lovely roast. I've never cooked venision before so I'd need to do some research before deciding what to cook. I think I'd keep it simple and maybe just make a port gravy to go with the steaks. Some sort of curry experiment! I think venison is definitely under-rated. I love my mum's venison casserole which is flavoured with juniper and has the added depth of a square of dark chocolate melted into it. Delicious and thoroughly recommended. Your dish sounds delicious. I would love to try a nice rich, venison curry. A rogan josh would be nice. I'd start with the recipe you give fore venison in cider. It sounds lovely! I would try to remake a lush venison wellington I ate in a restaurant last month! I'd make a venison version of lancashire hotpot so it could be cooked slowly..
At this time of year it would have to be a stew. I would make a chinese stir friend rice noodle dish with slices of venison instead of beef. I'd make it with a redcurrant sauce. 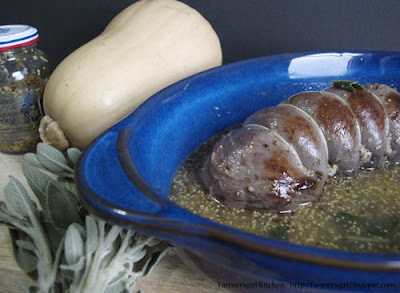 i would make a Vennison cassorole with redwine and a bit of chocolate added at the end. 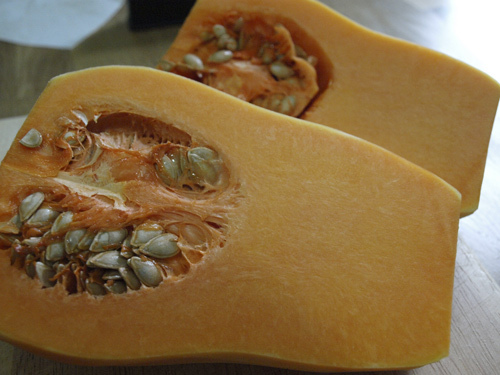 serve with a mash of butternut squash and sweet potato. I'd make Venison casserole - a lovely warming dish, especially for a cold, wintry Sunday afternoon! Venison burgers served with a homemade chutney. Slow cooked venison in a red wine sauce with shallots, served with creamy mash and fine green beans. In a Venison Wellington mmm sounds gorgeous already!! I'd definitely make a casserole for these cold winter days! I'll be making a casserole, yum! I would try a casserole with alcohol. I think I'd probably make a casserole. I think a venison curry would be nice! I'd make a one-off casserole in my slow-cooker with red wine, shallotts & mushrooms. I'd make a lovely pie with the venison. I have no idea what I would make but am exited to look it up now. Romanian Sweet and Sour Eggplant - Street Food!